In this ground breaking, award winning SEO course that has been taken by over 10,000 students and has an acceptance rate of over 95%. In it we will walk you through how to think like a search engine while keeping top of mind your users. This course bundle includes 6 modules each targeted in the steps involved in creating and tweaking your web site no users to site that is easily consumed by search engines. 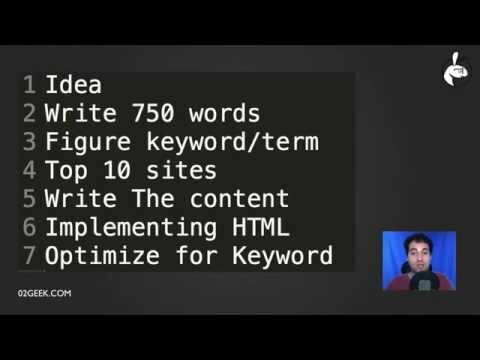 In part one of our SEO for content creators bundle we make the setup for SEO training while part two focuses on the core HTML skills, Part 3 focuses on the tools we are going to use and part 4 focused on the design phase of building web sites that are SEO friendly. Our next topic is going to be FireBug. Although this tool was designed for developers its incredibly powerful and useful for SEO people as well. Firebug basically enables developers to find bugs on there website but beyond that it is a very powerful tool. In this session we will learn the basics of Firebug and learn how to use it to test and improve our site. The next few lessons are all focused on leveraging firebug to get your pages to rank higher on SEO. It's a great practice to get used to working with this tool as it will empower you to create better pages. WE will see how to work with Firebug in action on our site that we are creating as well. Our first view will be our net tab that focuses on the actual content that is transferring through the web when your web site opens. It is a great place to find broken images or items that you load that don't work %u2013 it's always a good idea to fix that type of information. It is where you can see the size of your overall site load as well. We talk about file sizes and why it is important to try to lower the amount of files you load and the size of them as well. Speed is the name of the game. In the last lesson we talked about the size of the files and the amount of the files and how they effect your overall user experience but on top of these basic updates there are tools that help you and guide you through updates that are recommended to improve your site speed. We will look into it in this session. Some of you asked me why are you talking about page speed when this is a course about SEO? The answer is simple a faster site is a site that more users enjoy using and in return it means more organic traffic. Imagine you had great content just like your pears but the only difference is that your page is really slow while there site runs quickly. As such it is really important to improve the speed of your site the faster the better. In this lesson we answer the question what is the best speed score we can get? Your SEO is your hidden Sales force. Don't treat it as a way to push users into your site but use it as a means to build up users. Its really important that you treat every page as a welcome page to your site as users that find you on the web are going to drop into a middle page. Don't over manage pages but try to treat every page as if it was a stand alone page that can live on its own. In our break we got our developer to update the files to fix our issues with our design. So we got the files back and I wanted to show you the steps involved with uploading the files onto the server. And seeing what is better in this new design over the old design.